Fremantle Markets have been operating in the same place since 1897, which is quite a feat. A destination in itself, it’s a hub for fresh produce, organic goods, unusual eateries, indigenous and independent goods, and music and kiddies events on the weekend. I find Bush Food Cafe near the fruit and vegetables and the first thing I notice is, no, not the scones on the counter, but the colourful wall murals and the inscription – “Kaya is hello in Nyoongar” and the virtues of kangaroo, crocodile and emu meat. The cafe is run by local Nyoongar women Glenda Morrison and Neta Knapp and it serves witchety grubs, kangaroo stew and tail, emu, crocodile, roo dogs, wattle seed and quandong cakes and gum leave tea. At an indigenous themed cafe it’s weird to find scones, but then again, I wouldn’t expect to be served by a young guy with a thick Italian (?) accent I can barely understand. I’m a little disappointed when my scone is halved and dressed with the jam and cream, I do so prefer to do that myself – it’s part of the experience. 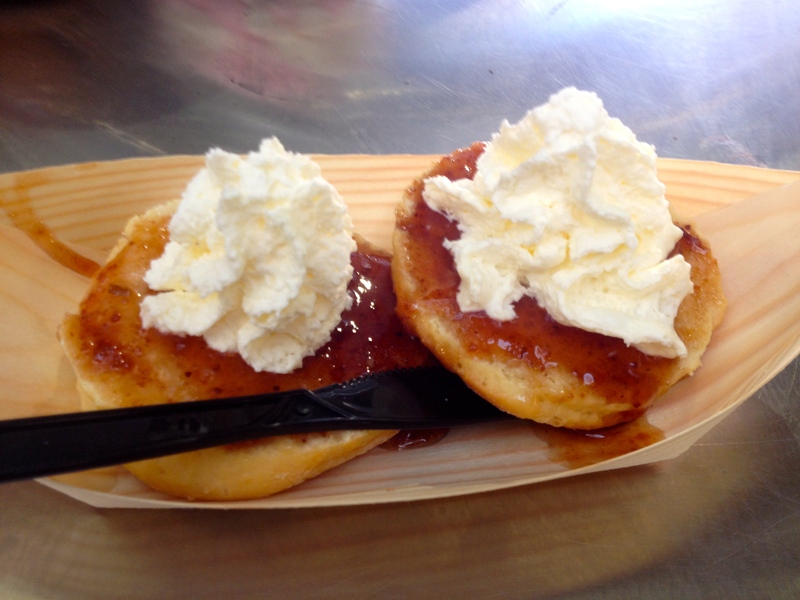 I also like my scones slightly warm; I never did like cold pikelets (mini pancakes) as a kid. There’s an unusual choice of jams and I try the quandong, although there is passionfruit/berry/fig marmalade (I think – remember, the Italian accent). I can’t really taste the jam as it’s thinly spread and the cream is fresh but very light. Pick up some unusual goodies before you leave. Tea: A range of teas including Australiana stuff like Aussie Breakfast, Gum Leaf Tea and Kimberley Tea. Overall: Strategically situated in the fruit and vegetable section of Fremantle markets. Fremantle Prison closed its’ doors in 1991 after 136 years in operation. If prison walls could talk they would tell tales of hangings, floggings, dramatic convict escapes and prisoner riots. When it closed, surprisingly the conditions of the prison cells were not any better than when it first opened in 1855, i.e. no running water or toilets, and it was cheaper to build a new prison than to renovate the old. Soon after it’s closure Fremantle Prison became a slice of Swan River Colony history and is now a place where visitors can explore. As well as general prison tours (Doing Time or Great Escapes) there are Torchlight Tours, which incidentally are NOT ghost tours, and for the more adventurous, Tunnel Tours. The latter delves down to 20 metres beneath the prison where you explore a labyrinth of tunnels on foot as well as in a replica convict punt. It’s a fine change from the usual walking tour. At the entrance to the complex is the Convict Cafe that has both indoor and outdoor seating. I wish I can say that the Devonshire Tea is as impressive as the Tunnel Tour but I can’t. The sultana scone is fine, with plenty of juicy sultanas and a slight crispy outside. To me, an ordinary scone can become extraordinary with the help of some good quality jam and cream. Unfortunately the Convict Cafe fails to deliver, with a Kraft portion-controlled jam and sickly sweet synthetic cream from a can. Tea: A Lipton’s tea bag served in a coffee cup with hot water. 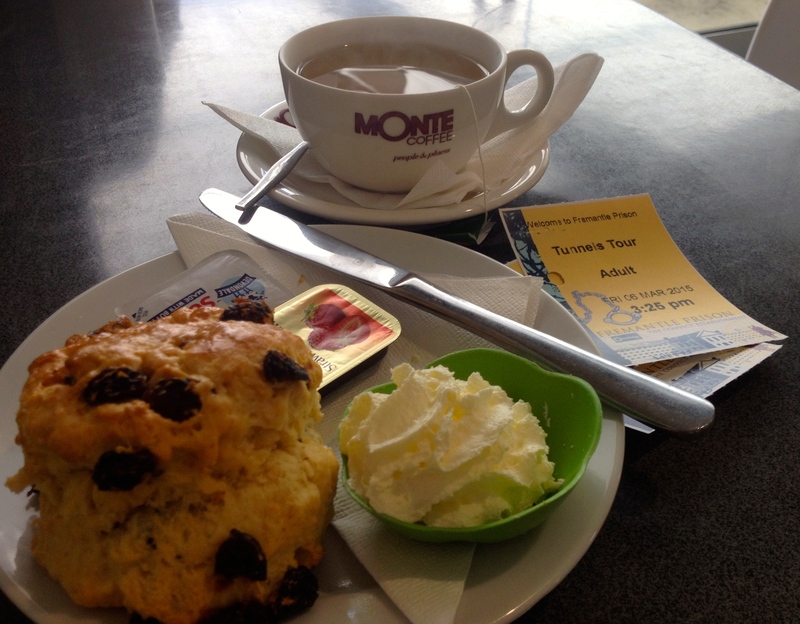 Overall: No doubt the highlight of the prison is not the Devonshire Tea but the history and myriad tours. Wander through the streets of Fremantle and explore the heritage buildings that are a testament to the early years of the Swan River Colony that settled at the mouth of the Swan River in 1829. Come 1987 and Fremantle was revitalised and gentrified for the America’s Cup and to this day remains a bustling city with enough to occupy a visitor for several days. Amongst a strip of eateries, The Fremantle Bakehouse is housed in an impressive heritage building with high ceilings and a large shady footpath to keep things cool for diners out front. I’m momentarily swayed by exquisite looking slabs of vanilla slice, which I later discover are sensational, and a bargain at $3.50 (think vanilla slice from Sorrento, VIC at half the price), but I remember my scone quest. Today, both plain and pumpkin scones are available, but this probably changes daily. 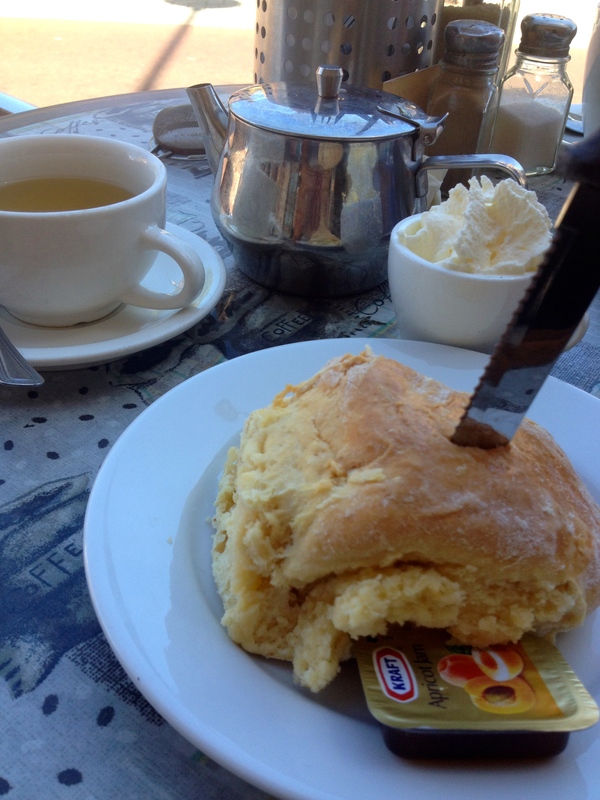 My plain scone arrives looking quite dramatic with a steak knife protruding from the top of it. This certainly is – different! The scone is over-warmed, and has a slightly steamed bun thing going on, which makes it a bit flavourless. The cream is fresh but way too light. Considering the size of the scone, I’m served one piddly sachet of jam. I ask for another, which isn’t a problem but realise when I go to pay at the counter there’s a basket of them, in hindsight I could have scooped up a handful. Tea: A small choice of loose-leaf teas served in a small teapot. Overall: A lovely historic Bakehouse in the heart of Fremantle’s dining precinct.